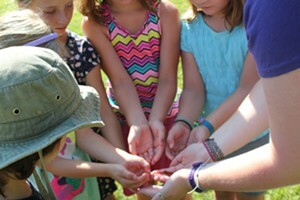 Parties on the Path | The Party Planner | Kids VT - small people, big ideas! Nola and Lily Roberts on top of Mount Philo. Taking a boisterous birthday celebration outdoors might be more appealing now that warmer weather is finally arriving. Nothing beats a walk through the woods or a mountain climb exploring nature, especially if you're a kid and have some buddies in tow! Here are a few not-so-traditional options. You may have visited the museum's indoor exhibits, but did you know there are trails outside to explore? From May to October, six different walking paths with trailside exhibits are open, as are the water features in the Science Park. Guests can get wet, take a hike and bring snacks to enjoy in the outdoor pavilion. King Arthur Flour provides lunch on-site from June 23 through Labor Day. Group rates are available for parties of 10 or more. Find more info at montshire.org. The Green Mountain Audubon Center in Huntington has an extensive trail system. A party there is sure to be an adventure. The trails are pack in, pack out, and open dawn to dusk year round. Trail maps are available at the office front porch. Picnic tables make partying a breeze. If you have a preschooler, consider reserving a one-hour salamander program to accompany the hike. There's a recommended donation of $1 per person to hike the trails; preschool programs start at $50. Find more info at vt.audubon.org. Mount Philo in Charlotte is a great first mountain hike for kids with stunning views of Lake Champlain. During the summer season, the summit is also accessible by car, where picnic tables and restrooms are available from Memorial Day weekend through October 12. It's a great place for a party. There's a day-use fee in the summer — $3 for adults, $2 for children 4 to 13, free for children 3 and under. I hiked Mount Philo last summer with my 3- and 5-year-old girls. They loved it and were looking for wood fairies the entire time! Word of caution when nearing the top — the trail forks. Devil's Chair is for experienced climbers only, so keep the little ones from going in that direction. Find more info at vtstateparks.com. Katrina Roberts is a Kids VT account executive and realtor who lives in Monkton with her husband, Kids VT publisher Colby Roberts, and their three girls. Got an idea for the Party Planner? Send it to ideas@kidsvt.com.